Anyone familiar with the bike the "Turnip Eater". Am trying to figure out best way to attach to a sportster frame. I am pretty good at fabricating and body work but this is a first and I want it to look professional and pass scrutinizing. 'Preciate any help. Buck Lovell is the former editor of Hot Bike https://www.facebook.com/bucklovell He knew everyone, including Leo Payne and Mel Disharoon. He lives in South Dekota, and still works as a photographer. Sporty Parts, in Fullerton, CA may have the parts you need https://sportyparts.com/ At one time they carried all the racing parts from the HD catalog. I haven't been over there recently, and they have new owners. Former record holder at RIR ½ mile drags, El Mirage and Bonneville. Beef Stew doesn't have his head where the sun-don't-shine. His head is in SoCal where the unusual is an everyday happening. I mounted an aftermarket GSXR fairing on the Sportster (with much assistance from Bob "Stainless" Steele) using a bracket similar to the one shown on Airtech's web page. Four point mounting and rock solid. Granted, there were a few more steps involved than just the front bracket/mount but overall was fairly painless. Thanks much. I am shooting for 1000cc MPGPS (Modified Production Gas Partial Streamlining) (Is that right) ? I got the fairing from someone who had it stored. Have a rigid mount sportster frame and a 2008 Buell XB9 motor. Looking for a lighter ironhead frame locally. I've got parts from them in the past. Old owners were good sportster fanatics. I have a lot of my own sportster hoard , but everytime I head one direction, it leads to another. Shooting for a 1000cc MP build with a buell XB9 motor on a rigid mount frame or an early ironhead frame. Someone told me not to get too light. Thanks to ya'll for your help and direction. 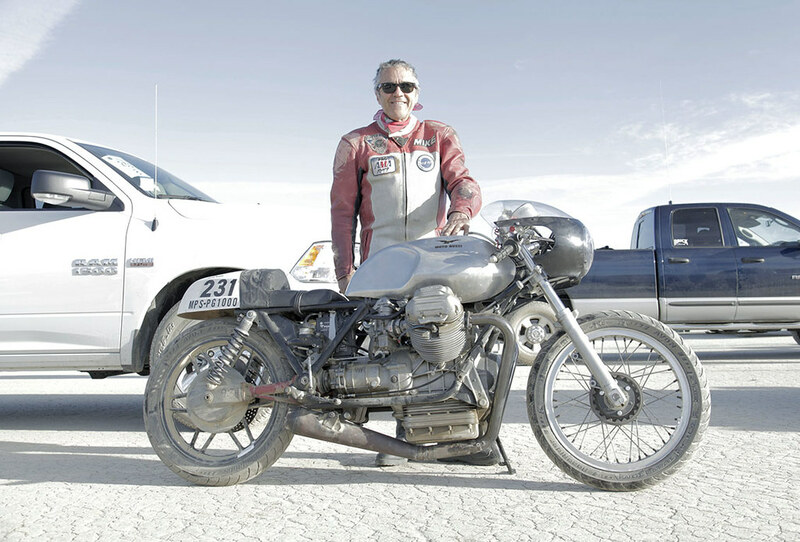 I ran that class last year on a 1000cc Guzzi at El Mirage. All I had was a small bullet fairing. I went 139.9, the minimum for a record is 144. Good luck, with the fairing you are looking at and the Buell motor, you should blow that away. If you are thinking about a Bonneville record, that is 169.9 done by fireman Bill on a Guzzi. Beating that will be tough. Thanks man, Yep that is the class I am shooting for. Didn't know if I had all the letters correct. Someone told me the AMA event record was 146 and change. I don't know if I want to run that event anyway. H-D used the Cal-Tec wind tunnel to design that fairing on Mr. Leo's motorcycle; Saying it was the best design for that bike. I always liked the Turnip Eater; It looks fast sitting still. I can manage the parts list fairly cheap. Got frame, have engine, have fairing; Have 40 years knowledge and experience with the XL. I should do ok; Except I have never gone fast on salt; Just asphalt and some holligan flat track races. I found the fairing mounts on Airtech's site; So I have that covered. I can come up with side mounts and such. I sure appreciate all the help I get here. Oh yea, I have a 1968 Moto Guzzi, supposed to be an Eldorado. I kinda like it. I would own a new Eldorado except there isn't a dealer within 1500 miles of me. Looks like Leo mounted the fairing with the fasteners from that time period. Dzus 1/4 turn buttons and spring plates are the way to go today. Photo of typical brackets on a half fairing with 4 mounting points, may want to go with 6 mounting points on a full fairing.